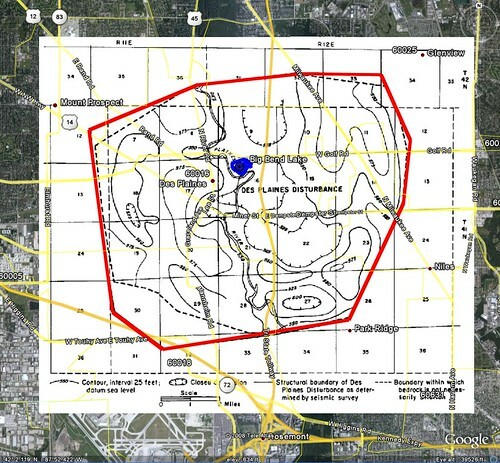 1) Please take waypoints to estimate the width and length of the impact zone (the lake). 3) Post a picture of you at the lake. This lake represents the probable impact point of a large ancient (280 million years ago) meteor crater 5.5 miles wide x 4.5 miles in length. Big Bend Lake An impact crater forms when an asteroid or comet strikes another body such as an asteroid, planet, or moon at high speed. All of the surfaces of the inner planets and their moons (Mercury, Venus, Earth, and Mars) have been heavily bombarded. Because the Earth is so active geologically, most traces of impact craters have been erased by erosion and tectonic activity. Nevertheless, over one hundred seventy impact craters have been identified on Earth. Several more are found each year. 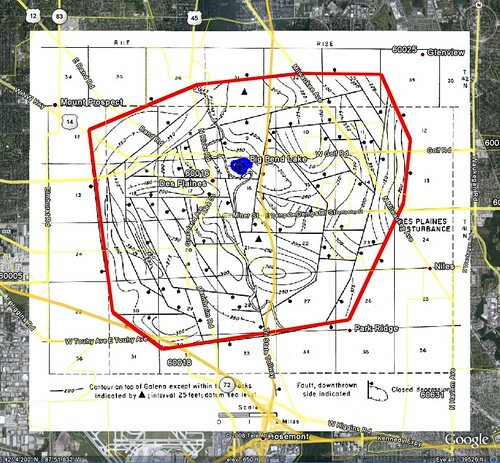 Portions of Des Plaines are underlain by the "Des Plaines Disturbance", an area in which the layers of sedimentary rock are highly abnormal. The bedrock was highly fractured by the impact, with large blocks of sediment upended. Most of the crater was eventually filled by glacial activity. The disturbance is a roughly circular area of approximately 25 square miles that is intensely faulted. Some of these faults may have as much as 600 feet of vertical movement. The roughly circular site exhibits complex faulting and shock features such as percussion fractures and strain lamellae, as well as a few shatter cones. 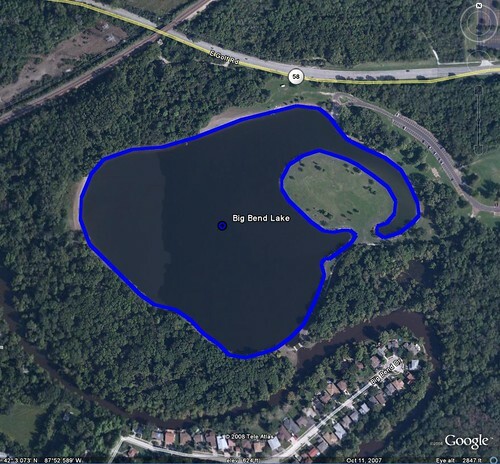 The center of the crater lies under Big Bend Lake on the Des Plaines River. 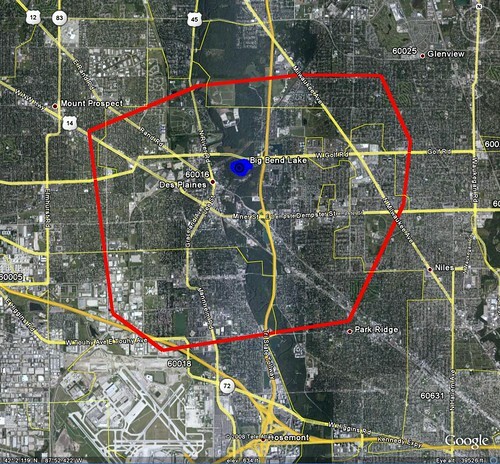 Seismic reflection data suggest that there are numerous other faults within the bedrock of Cook County. None of these faults are currently active, and the seismic risk to the Chicago area from them is minimal. The impacting body generally melts and mixes with the rocks at the impact site. Sometimes the impact site reveals an abundance of siderophile elements such as iridium, osmium, platinum, and palladium. Other tell-tale signs of an impact are products of shock metamorphism such as shatter cones, planar features in quartz and feldspar, diaplectic glass, and a high-pressure form of quartz called stishovite. Stishovite has never been found anywhere else but impact sites. Impact craters may be simple or complex. Simple craters are relatively small with a smooth bowl shape, and exhibit a depth-to-diameter ratio of about one-to-six. Meteor Crater in Arizona is a good example of a simple impact crater. This crater is about 1,200 meters in diameter and 170 meters deep. The crater rim rises nearly 80 meters about the surrounding plain. The crater was formed between 20,000 and 50,000 years ago by the impact of an iron meteorite weighing over over 60,000 tons. Complex craters are larger in diameter but shallower in depth. Complex craters usually possess a depth-to-diameter ratio of between one-to-ten and one-to-twenty. Gravity collapses the crater walls downward and inward. A central peak may form when the crater floor rebounds from the impact. 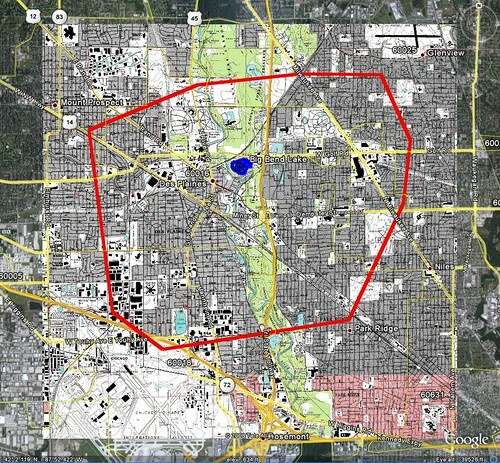 To become complex, a crater must have a large enough diameter. On Earth the transition diameter lies between two and four kilometers.